Meanwhile, Modern Warfare 2 gives us … exactly the kind of obstacle-course tutorial that’s so commonplace in the franchise. 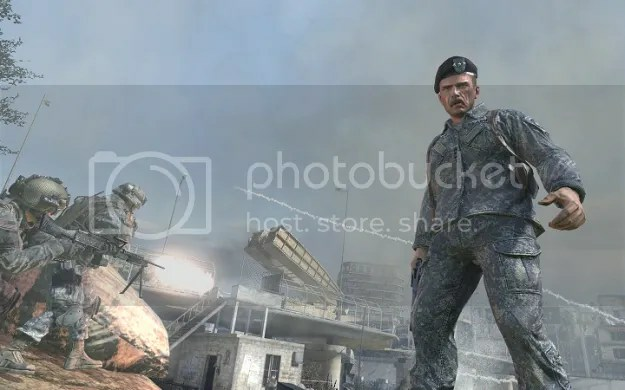 Your introduction into the world MW2 starts off small, as you (as temporary protagonist Joseph Allen) train local Afghani militia before responding to an insurgent uprising in a nearby city. 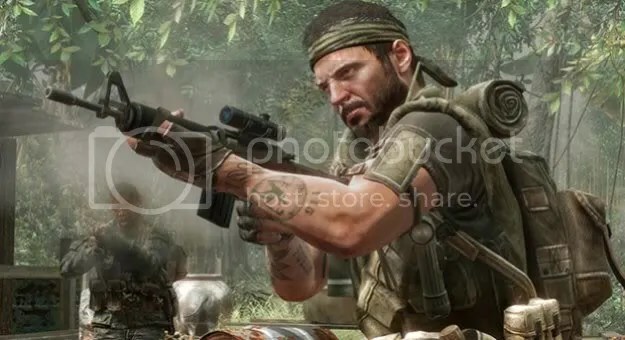 Despite the fiction carried over from the first game (a faction of ultranationalists seizing control of modern-day Russia), the ripped-from-modern-day-news-footage Afghanistan levels already present an approximation of “real life”. From there, things start getting wacky. Things get wacky in Black Ops, too — hallucinations, multiple personalities, brainwashing, dual-wielding machine-pistols while jumping across rooftops, John Rambo-style one-man-army heroics, the Rolling Stones, and enough Vietnam movie cliches to provoke a lawsuit. But the Cold War era was pretty wacky, too; we’re talking about a time when people honestly believed that MSG was a Red Chinese mind-control agent and two of the world’s biggest superpowers took every step they could toward mutually-assured destruction. And that’s Alex Mason: a delusional, paranoid tough-guy who’s being pulled in two opposing directions. From what I can gather, Modern Warfare 2’s major theme seems to be that the needs of the many outweigh the needs of the few. 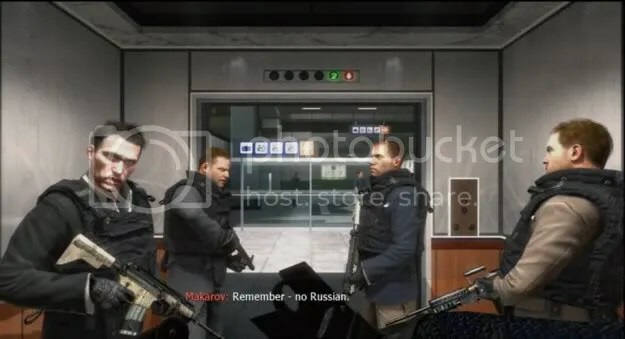 It addresses this in some overt ways: the infamous ‘No Russian’ level, in which the player, as Allen, takes part in a terrorist attack on a Russian airport, and Captain Price’s “attack” on the U.S., where the character launches a missile at Washington D.C. only to detonate it in the stratosphere, unleashing an EMP that ends the Russian invasion of the United States’ east coast by shutting down all of the heavily-relied-upon electronic equipment of both sides. This occurs at the cost of many lives and the International Space Station, which is destroyed in orbit during the blast. Both actions are performed in the name of sacrificing the few to save the many; if Joseph Allen breaks his cover to stop the airport massacre, then the good guys lose their main source of intelligence in the villain’s world-threatening plot. If that nuke doesn’t set off the EMP that fries those electronics, dropping planes out of the sky and destroying the International Space Station — and killing the astronauts working there — then the war between the U.S. and Russia escalates with no end in sight. The problem is that both actions achieve nothing in the end. Allen is discovered and executed after the airport massacre and the real mastermind behind the war between the U.S. and Russia, U.S. General-turned-Bond villain, General Shepherd, still achieves his plans (at least, in the short term). So is the theme of Modern Warfare 2 that the needs of the many outweigh the needs of the few? If so, it’s never reinforced; the needs of both are consistently screwed over. For a time after completing MW2, I thought the theme might just be cynicism. But in that case, what’s the purpose of supervillain Shepherd’s existence, much less his appropriately gruesome and satisfying death? The main-antagonist-turned-supporting player, Makarov, still gets what he wants — war — but his victory rings hollow considering his ancillary role as, essentially, a plot device. And that’s the issue that I had with MW2’s story — its compartmentalized elements never come together to actually say anything. The themes hinted at in the plot are only ever explored enough to reach the next major set-piece, and then they’re dropped entirely. Meanwhile, the player’s entire motivation is centered around a frigging cartoon — General Shepherd and his Legion of Doom. 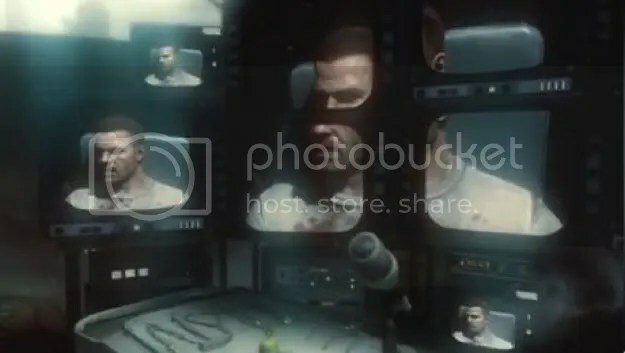 I wouldn’t call the story of either game good, but at least Black Ops knows what it’s about. While its plot is ridiculous, its storytelling at least reinforces its themes.